DURHAM — On voluminous recordings, concerts and television appearances, when James Brown said “Hit Me, Fred,” he was signaling trombonist Fred Wesley to play a solo. From 1968 to 1975, Wesley was Brown’s music director at a time Brown was releasing “Mother Popcorn,” “The Payback,” “Cold Sweat” and other funk classics. The New JBs usually tour Europe, but this month are on a tour of the Southeast that includes dates in Asheville and Greensboro, where Wesley will record a new piece that trumpeter Mondre Moffett composed with Wesley in mind for a CD commemoration of the International Civil Rights Center and Museum. Wesley said he is looking forward to playing at Beyu and Durham, where he has local musical connections. Wesley comes from a musical family. He studied classical piano with his grandmother, a music teacher. 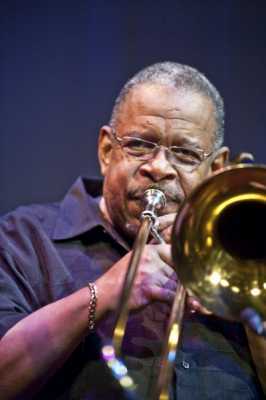 According to an allmusic.com biography, he gravitated to the big band music his father, Fred Wesley Sr., who was music department chairman at Mobile (Alabama) Central High School, listened to, and took up trumpet and finally trombone. He played in bands in the Army, and a few years after leaving the service got the call from a member of the Brown band. As a future project, Wesley would like to do a blues album. He recalled hearing the blues being played in the Blue Diamond Café, next to his grandmother’s house. “I’m going back to the basics,” he said.